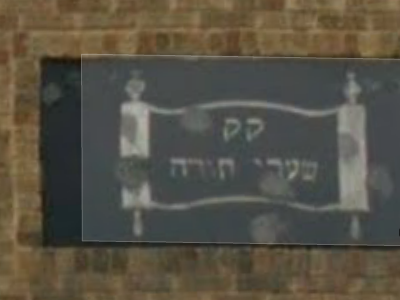 The text says "Shaaray Torah", the name of the congregation, but what is the meaning of the two qofs above it? Likely, it is an acronym for קְהִילָה קְדוֹשָה k'hila k'dosha (lit: holy congregation), a title for Jewish communities whose use dates back to the Talmud (Tamid 27b). Not the answer you're looking for? Browse other questions tagged hebrew synagogue symbols-symbology . What is the ideal design of a synagogue?